from the site: Geography of the Middle East, North Africa, and Europe covers the area that constituted the ancient Roman Empire. Each region is explored in its historical context in “History’s Headlines,” as well as in the present in “Tour of Today.” Your student will learn countries and capitals of today and relate them to the ancient lands of the Greeks and Romans, deepening his understanding of both the past and the present. 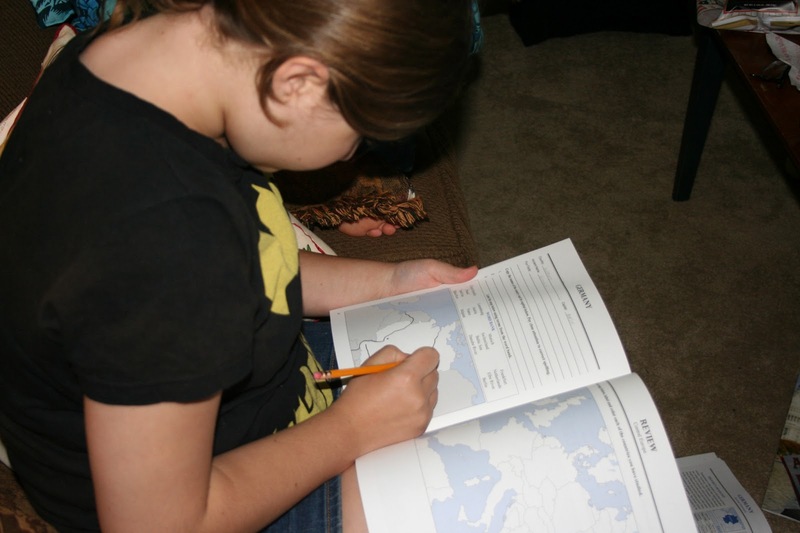 Geography 1 is an easy to use and follow geography study with black lined maps, short readings on the country being studied with fun facts and photographs and country flags. You will read a small snippet on the history of the country as well as a small snippet of current information. For each region you will learn about the area in general. You start out studying the middle east, then off to North Africa, and then end to study Europe. You will visit countries like Israel, Lebanon, Egypt, Sudan, Portugal, and Finland. For the United States geography study you start out reviewing New England and end at the Pacific States. You will also be reviewing the capitals and where they are located in the state. Memoria Press is one of those companies that I found through my first year on the Crew, during the 1st year of the Crew, and it is still one of my favorite curriculum companies. I find what they provide very easy to follow and implement in to your day. 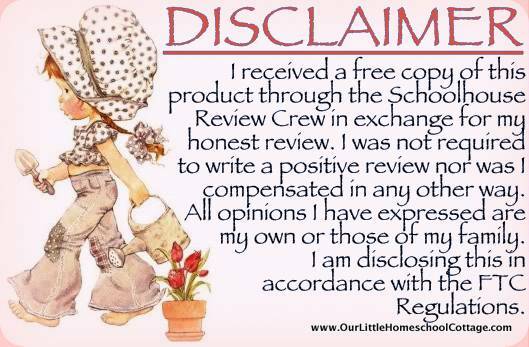 Just for this review we used this once a day reading and studying one to two countries a day and doing the corresponding workbook. Memoria Press suggests 2-3 countries a week. You will recognize the shape of the region, the country, the capital of the country, and facts of the country. Some regions like the Middle East we finished in two weeks while smaller regions like The British Isles and the Low Countries you can finish in week. You can also pace your self to go slower or faster. If I were to use this in our regular studies, I would have done the region that corresponded with our history studies. So if we were studying Egypt then we would have used the North Africa section to correspond. I feel you can jump around if you want it to correspond with your history studies. We also chose to read the student text first and then moved on to the workbook and we also looked for the country on our desk globe to help reinforce and to see where the country correlates to the United States. You can do these as fast as you like, we preferred a speedier time frame but you can feel free to slow it down depending on your child/ren’s learning style or focus. If you have more than one child, you can make a “race” game to help with reinforcement. I would say a country and they would race to find it on the globe or wall map. I had thought of tracing the countries on to card stock and see who could get the most countries right the fastest but we didn’t make it to that, but I wanted to mention it in case you wanted idea’s for games. These kinds of games work for my girls because they are very competitive for “who knows what”. We didn’t get started on this but we are mentioning it because it is part of the package. As we use it later we will share more about it. I really like that its a simple review curriculum that I can easily add to my regular study of the United States. We have studied US history in the past and this coming year we will be doing a deep study on the US and we will also go over US geography. I am eager to include this in our map studies as it will help cement it in. I also believe that you can use this as a first introduction to mapping or geography if your child hasn’t studied it yet. You would use the workbook the same, having your child fill in the black line maps. 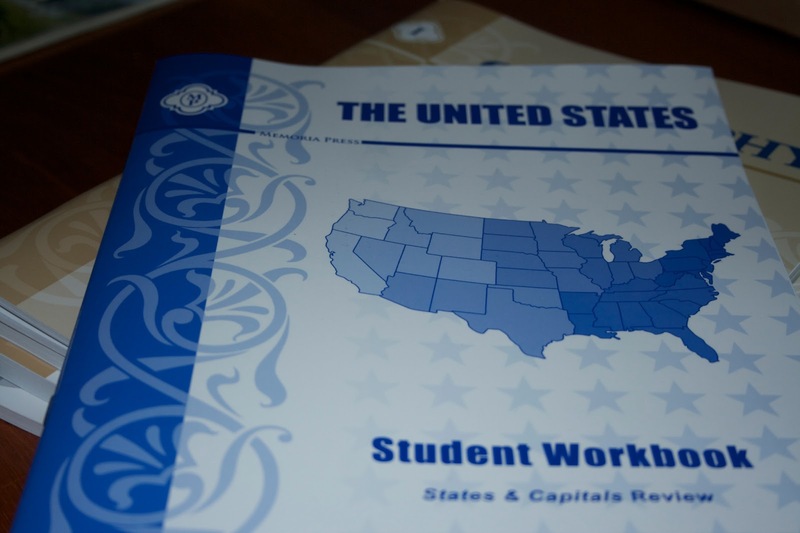 You can also purchase the United States curriculum separately by clicking HERE. 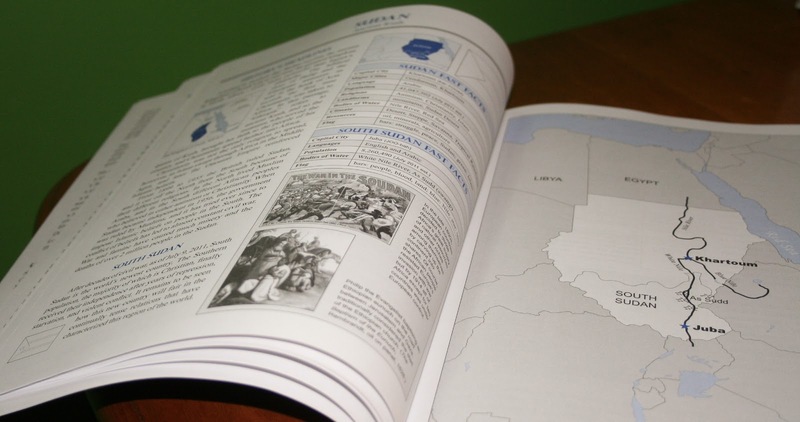 In my “oh so humble” opinion, Memoria Press offers top notch curriculum that is easy to use and implement and the Geography 1 set delivers that same quality.